A few weekends ago, I visited the beautiful art galleries of Brisbane - the Queensland Art Gallery (QAG) and the Gallery of Modern Art (GOMA). I hadn't visited the gallery since Yayoi Kusama's obliteration room was at GOMA back in 2015. When I headed to the Queensland Art Gallery, I experienced Yayoi Kusama's iconic work Narcissus Garden which felt so serene and so peaceful. I then headed to the Gallery of Modern Art (GOMA) and experienced Kusama's latest exhibition Life is the heart of a rainbow before it finished on Sunday 11th February 2018. Kusama's work since the 1950's was surveyed extensively for this exhibition to include her early paintings, her celebrated 'net' paintings and why they came about, the meaning of her dot obsession, her soft-sculptures, her iconic 'infinity rooms' and large-scale installations of her later career. Turns out that her paintings of loops and dots are a physical representation of the idea of infinity and were a result of Kusama's hallucinations as a child. Kusama is well known for her obliteration of art like the Statue of Venus (shown below) obliterated by Infinity Nets. She is also known for her obliteration rooms that many children and carers LOVE. Kusama's love of pumpkins and dots was shown in The spirit of the pumpkins descended to the heavens' infinity room she created in 2017. This piece was shown at QAGOMA during this exhibition. It was represented in a small cube that people could pop their head into and visualise the infinity. Children I saw visiting the exhibition loved the 'flashing frames' as they call them which is a mix between inflatables and flashing lights with Kusama's dot obsession. But most importantly, the exhibition presented Kusama's most recent paintings from her latest series My Eternal Soul which she has been working on since 2009. I especially loved the other cubic infinity room titled I want to Love on the Festival Night. Looking through the peepholes in this infinity room which has four different peephole spots was particularly funny and a cute experience thanks to the little boy pictured below! I especially loved the My Eternal Soul room which had the most impressive and colourful large-scale polka-dotted inflatables and paintings. 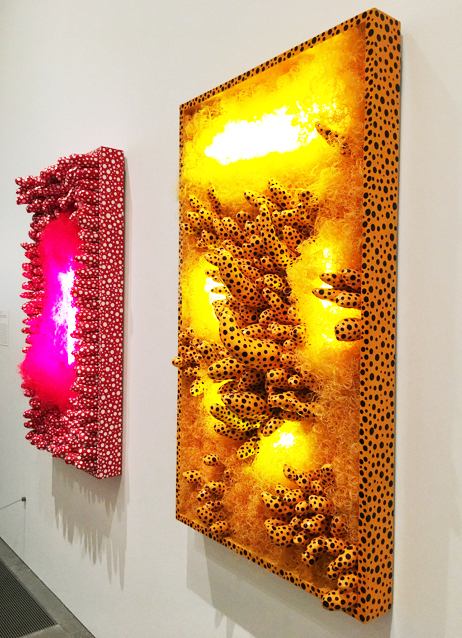 What's even more impressive is that Kusama has been working on these works since 2009. I am still coming to terms with having waited one hour for a 30 second session to visit the Soul Under the Moon infinity room. Was it worth waiting that long for such a short session - yes absolutely, because I will probably never see anything like this again. See our video on Instagram to see what the fuss is about. The most interactive spaces of the Life is the heart of a rainbow exhibition and especially designed for children was the Obliteration Room. Children were invited to add colourful dot stickers to a blank common domestic room - so much fun for people young and old! This was a true hit for little ones and their parents! I am so glad I visited this exhibition. It was a true experience and I hope Yayoi Kusama's work comes to Australia again in the near future! For more information on Yayoi Kusama - Life is the heart of a rainbow at GOMA, head to their website.